The report starts by asking the question of what verbatim functions family and marital union undertake in society for sustainable development and what costs societies do bear when these functions are undermined, across population shifts, public health, political and social stability, and economy. The report then looks at demographic, economic, and cultural shifts that have been challenging family and marital formation. Demographic and economic changes involve a variety of substantial shifts, such as industrialization and urbanization, hunger and poverty, immigration and displacement as well female labor force participation, population ageing, fertility rate, and age at marriage. The report also maps socio-cultural trends and their impacts on family and values and union with a focus on value transformation of Generation Y or the Millennial, who will be shaping future structure of family, parenting, and spousal relations. All of these changes occur in a particular policy environment, and whether this environment is family friendly or not determines how well families can respond to surrounding challenges. The final section, as such, looks at current government policies on family and marriage including but not limited to governmental spending on family, policies regarding violence against women, policies on family planning and family-work balance. The report concludes by drawing policy implications and addresses possible social security and economic measures as well as socio-cultural policies. The report highlights that the future resilience and strength of family and marital values will depend in large part on how the new generation manages challenges surrounding them; but their performance and ability will largely depend on how well policymakers today can address ongoing and upcoming challenges. 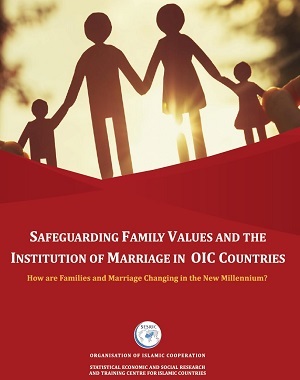 This report, as such, is a quite timely and appropriate effort, hoping to contribute efforts in member states to preserve family and marital values and union.